In all of us, there are two football fans. There’s the heavily biased guy who’s got all sorts of preconceptions and scoffs at data that appears to contradict what in his heart he knows to be true. This guy, for example, doesn’t care that Iowa is undefeated and has beaten Penn State and only has Ohio State, who is struggling with teams like Purdue, left on the schedule. He knows Iowa is Iowa and there’s just no way they belong in the national title game if Texas loses. The other fan in all of us is the rational one. He knows that football teams change and that he has to do a very careful analysis of every game and every injury and every schedule to even come close to understanding who’s good and who’s not. This guy is a lot more unsure than his biased counterpart. So you can imagine these two fans sitting on each of your shoulders like the angel and devil in the stories/movies/books of old, albeit without the explicit goodness and badness of each. And just like that old imagery, in some of us the biased fan is very strong and it appears the rational guy doesn’t exist. In some of us the rational guy is so strong it appears that there is no bias. Personally, I like to believe that in me I lean towards the rational guy most of the time. The reason I bring this up now is because my biased guy scoffs and scoffs LOUDLY at ASU. He doesn’t care that ASU beat Cal in 2007. He knows that ASU team was the luckiest team in modern football, squeaking by against a crippled Cal team in a game they in no way deserved to win, as well as many others that year, and perhaps was the worst 10-2, Holiday bowl losing team in history. His suspicions were confirmed when ASU fell of a cliff in 2008, not even reaching bowl eligibility. And he knows that this year’s ASU team with their “dominant” run defense is a joke for the ages. He knows Cal can destroy that team if they put up even a modest effort, perhaps not even as good as their performance in the Rose Bowl and definitely not as good as their performance in Minnesota. I mean, COME ON! It’s the over-the-hill, Carpenter lacking, Erickson show. Those guys don’t know defense in Tempe, right? And I’ll be honest, my biased guy is WAY over-powering my rational guy. Sure, my rational guy tries to get in a couple of points arguing that giving up 82 yards a game on the ground is impressive no matter who you’ve faced (Phsh, did you SEE what Stanford did to them on the ground?) and they played a noble effort at Georgia despite losing, something that is always difficult to do (Chsh, yeah and those wins over Idaho State, not even Idaho proper, and Louisiana-Monroe really bolster the resume, who have the actually BEAT!?!) 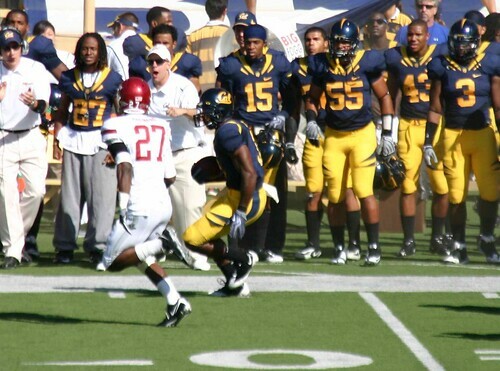 and that win over Washington, who lets not forget beat the USC team that creamed us, shows they’re dangerous (Fttt! Did you SEE the non-defense that UW put on the field in the winning play at the end of that game? 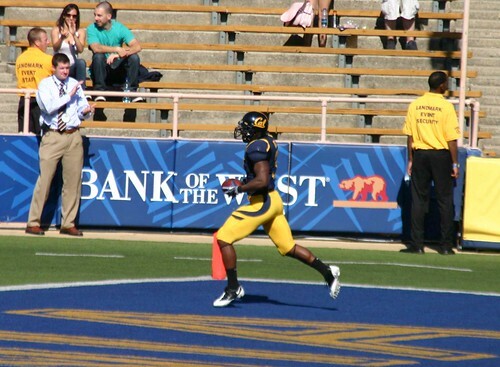 ), and yeah, my statistical preview over at BearTerritory.net shows a fairly even game but in the end, the biased guy is winning the battle of hearts and minds in my head. Maybe it’s because my rational guy just doesn’t have many arguments to work with or maybe it’s because my biased guy is so strongly biased. However, my rational guy and my biased guy were on the same page about WSU and they don’t feel on the same page about ASU. Nevertheless, I just can’t believe that Cal is going to lose this game. The biased guy is winning the argument with ease. Minnesota: After Anger punts from his own 12 yard line with just over a minute left, Minnesota is able to score on a two-play 29 yard (it was a short punt with a personal foul) touchdown drive ending with 40 seconds left to narrow the halftime score to 21-14. In what was looking like a dominant Cal performance, the one-score halftime lead was key to Minnesota getting back in the game. Oregon: After a disastrous 1st half, the Bears were only down 3-18, just two scores, with two minutes left. Anger shanks the punt from midfield, netting only 5 yards, and Oregon runs on 4 consecutive plays confusing the Bears who are expecting Oregon to pass with this little time left, scoring a surprisingly easy touchdown with 59 seconds left to effectively put the game away before halftime. USC: No end of 2nd quarter score – HOORAY! UCLA: After scoring a touchdown with 46 seconds left to put the Bears up 35-17, three scores, the Bears go into hyper-prevent mode and let UCLA march down the field and make an easy field goal as time expired to get back to a two-score deficit. 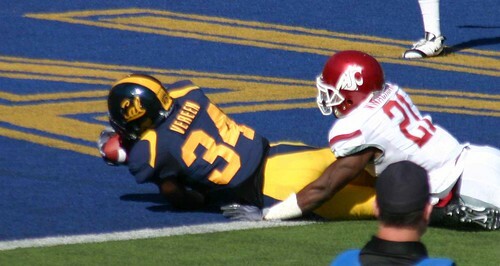 WSU: After giving up their first touchdown with under 5 minutes left in the half, Cal uses just over a minute going 3 and out and then lets WSU march down the field in 8 plays to close the score to 35-17 with 33 seconds left, giving the WSU faithful (singular) hope that a comeback could be in the works. So there you have it. In our last 5 games we’ve given up scores in the last minute of the half in 4 of them, for a total of 20 points, 2 touchdowns, 2 field goals. When I asked Coach Gregory about it, he called it a lack of focus. I completely agree. I think these guys are mentally getting ready to go into the locker room too early and not playing the last minutes like they matter. And while the end result probably didn’t change in any of those games because of the scores (only Oregon is minorly in doubt, if that, as it killed the idea of a comeback, but we won the rest), I think it’s a really troubling sign to see the players checking out too early before halftime. Luckily Coach Gregory has recognized the root problem with the players. But I also think there is something else. I also think that the defensive play-calling is too soft during these times. I think they’re going too prevent, particularly in the UCLA game. While I’ve done my best to block out the Oregon game, I also remember thinking that the defense looked too prevent-ish in that last TD drive. Since I didn’t see the WSU game it’s hard to tell, but I get the feeling they were playing too soft that time too. So I really think that it’s bad game-planning as well. And here’s the key question: Is the passive prevent encouraging the players to mentally check out? I think it’s a real possibility. And it worries me. A lot. Here’s hoping it won’t matter in Tempe either. Our longest and most interminable episode yet! If you can get through this one, you’re made of Sturdy Golden Stuff. Ken didn’t go to the WSU game. Jason did. This adds up to some pretty random analysis. We pre-hash the ASU game. 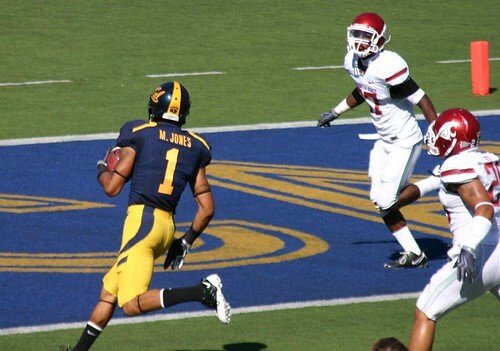 We talk Pac-10 football, including bowl scenarios both ridiculous and sublime. Jason goes on a lengthy rant (people who actually have lives, fast forward through this part) about feeling kind of oogy about going to games in an era where Cal’s teams are actually successful. And what does The Lion King have to do with it all? If you can figure out what the heck we’re talking about, let us know, because we have no idea. Jason also does a terrible Larry King impression and we provide homework for our listener(s). CalBears.com has announced the time for the Cal-Oregon State game. It’s a 4 p.m. start, and will be televised on the Fox Sports Net / Comcast Sports Net network, including CSN Bay Area. That leaves Arizona and Stanford times yet to be determined. I was perusing Jeff Sagarin’s computer ratings this morning. His composite ranking places Cal 17th in the country overall, though his Predictor rating (which is more accurate, though less politically correct because it takes into account margin of victory) places them 28th. I was more amused by the ratings of the teams Cal has played this year. Talk about three stinkers: Maryland is rated 115th overall (below a few I-AA schools), Washington State is rated 119th, and I-AA Eastern Washington is rated just one slot below the Cougars at 120th. Cal’s other wins were over Sagarin #42 UCLA and Sagarin #59 Minnesota. In contrast, Cal’s losses? To Sagarin #3 Oregon and Sagarin #5 USC. That’s the good news. The bad news? Cal has yet to play Sagarin #14 Arizona, Sagarin #23 Stanford, and Sagarin #24 Oregon State. In terms of the pure Predictor rating, Sagarin would predict that Cal will finish the season 9-3, with wins over Arizona, ASU, and Washington and a loss to Stanford (!). I can’t really call that an unreasonable prediction. It might even be optimistic. But as always, computers don’t play the games. So we’ll see. Here are some select photos. You can see the whole gallery on Flickr. The good folks at other Cal blogs are welcome to re-use any of my photos with attribution or a linkback to Excuse Me For My Voice. I’m just warning you, there are a lot of photos of guys in the end zone or running toward the end zone. Marvin Jones scored early on (above). 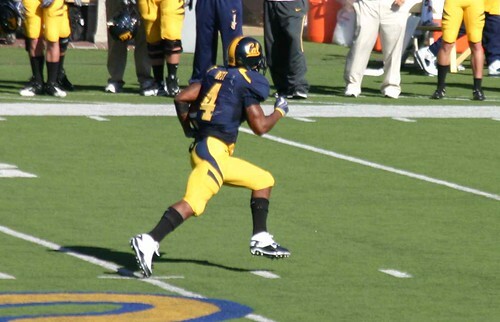 Jeremy Ross scored on a punt return (below). Shane Vereen also scored in the first quarter. 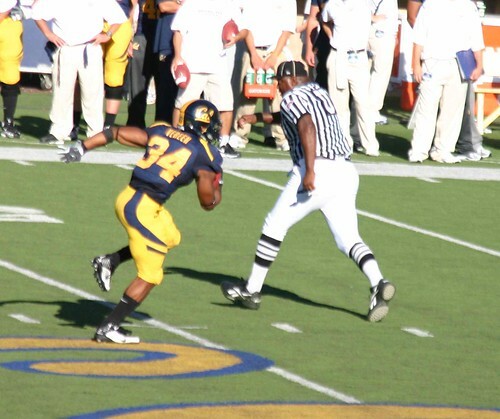 Jahvid Best got in the action, too. Vereen ripped off a long one later in the game. Hi everyone. Ken’s at a wedding and I’m about to head out to Berkeley. But if you’d like to talk about the game, feel free to post in comments. I’ll have a report—with images!—when the game is over. Sorry this is so late (catch a re-occurring theme here?) with the OTRH podcast. While it was recorded right after the game, the trip to Disneyland and the ensuing backup at work when I returned had me scrambling to find time to edit it all together. But it’s done before the WSU game, so I’m not THAT late. So in the latest podcast I mentioned to Ken that I split the entire set of I-A football teams up into conferences and divisions by team nickname. He suggested that I post the list. So here it is. I realize this is ridiculous. That’s sort of the point. Please share your thoughts… if you dare! No, seriously. We’re back like a bad habit. Jason and Ken are happier than last time. And although we skipped a week, this is a giant-sized edition, for those people with all sorts of time to kill. Topics this week: Recapping the UCLA victory; looking forward to Washington State; Pac-10 results; trivia involving the names of Division I-A team mascots and how many Cougars are among them; why we’re not okay with a 4-8 season, but still think Tedford would deserve a mulligan; in which conference Cal would play if all Division I-A teams were split up by mascot type; Jason completely fails as an impressionist; Joe Starkey evaluated. I’m starting bidding at half price and have a buy it now for what I paid for them ($50 a seat). The bidding ends Wednesday and I’ll get them in the mail to you so you get them Thursday if you pay me right away. I’m stuck at a wedding next Saturday. Take advantage of my pain and buy my tickets! It’s also subscription, but I like to link them all here if nothing else but for my own record. Now that the game isn’t going to be on TV, don’t you want to go and see it in person? I’ve got 6 tickets for sale at $50 each (my cost). I’ll sell in groups of 3 or all 6. They’re some of the better seats outside the donor section on the west side: Section DD, just above the concourse tunnel (so there’s no one sitting in front of the 1st of the two rows) on the isle. E-mail me at tickets AT excusemeformyvoice DOT com, if you’re interested. I’ll be putting them on E-Bay later this week if I don’t get any bites here so e-mail soon if you want to get them. 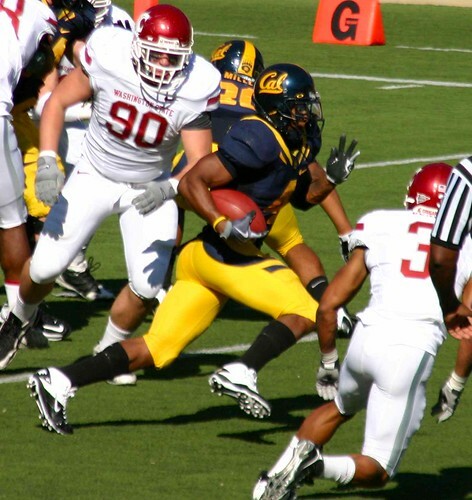 The University of California has announced that October 24’s Cal-WSU game will not be televised and will start at the delightfully early time of 1:30 p.m. This is what happens when you lose two games by gigantic margins and your opponent is the consensus worst team in the conference. That said, I can’t wait to go to a game at Memorial Stadium with the sun high in the air. We’re back with — apparently by popular demand — our longest two-man podcast of the season. Though if you factor in the fact that last week there was no podcast at all, we’re still coming up woefully short in overloading you with more podcast than you can handle. In any event, Jason and Ken are here for you. Here to tell you to think positively. Here you comfort you in your time of need. Here to… oh, who are we kidding? We’re here to weep softly to ourselves. Topics this week: Why Jason left early; why we’re sad (hint: Oregon and USC); what the future holds; if Jeff Tedford should take out that second mortgage; the overcrowding at Memorial Stadium; the irony of Cal’s 2009 season poster; Uni Watch spots something funny in the Fun Zone; and how podcasting is cheaper than therapy.